Once I sat on a beach and watched my wife, Sarah, fly a kite. The kite was broken and was wet (it had fallen into the sea several times). I had long since given up, but Sarah kept going. She kept picking it up, fixing it, throwing it into the air, and watching it break that little bit more. I had no hope. This thing is dead, I thought, why bother with it? We’d be better off getting a new kite. 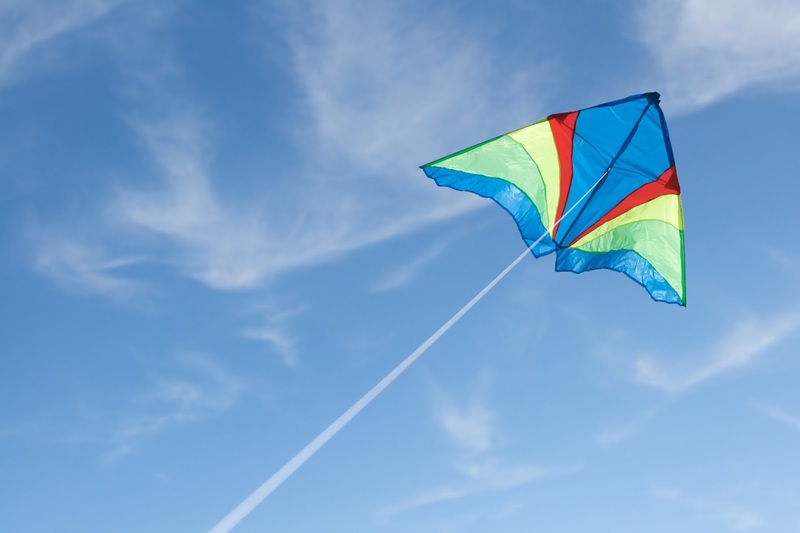 Perhaps you feel like the kite. You are broken, tired, and wet from whatever troubles life has thrown your way. In a sense you have quit, given up on the spiritual life. You feel there is no way to fly so you carry on with life just as you can. You have enough to get by; there is no drama, no excitement, but you live, keeping your head down, keeping calm and carrying on. God sees us do this. He sees us like Sarah sees the kite. He sees that we are broken, but rather than go and get a new kite he picks us up and fixes you, brushes you off and throws you into the air. You might feel like you are done, finished, kaput, but God is not done with you and will not quit on you. When God’s people fail, God succeeds; when they descend, he ascends; when they fall short he rises to the challenge; when they flop he picks them up; when they fold he completes them. The children of Israel found themselves in such a place. They were like the kite. They had given up. For sixteen years they had left the temple unbuilt. Once it had stood as a beacon to the world for the presence of God. Now it was little more than a few walls. The destruction of the temple had left nothing and the efforts of the people who returned to Jerusalem after they were released from captivity had not achieved much. The people had given up. They survived, but only just. If it had been me, I would’ve quit on them, gone and found some willing workers. But God didn’t. He had chosen these people and would see that they completed the work so that they could enjoy his presence, so they could fly again. Have you handed in your resignation this morning? Is it a quitting day for you? Perhaps you know someone who finds himself or herself like Israel, a broken, wet kite. Your spiritual life is there, but only in part. You have neglected the Lord, left him out. Perhaps the church, for you, is where you turn up every week, but it has been a long time since it turned you up, a long time since you knew his presence here. Perhaps you remember a time when your faith was full and your vision of the Lord so clear. He was so close. Yet now you wonder where he went. And you survive, hoping to make it to heaven with one wing. You can limp along on the currents of the ocean, but it has been a long time since you flew. Haggai writes to encourage the people of God. He warns them about their apathy and their sin and he encourages them with the promise and presence of God. When his people’s hearts fail, God is not beaten. Then Zerubbabel the son of Shealtiel, and Joshua the son of Jehozadak, the high priest, with all the remnant of the people, obeyed the voice of the Lord their God and the words of Haggai the prophet, as the Lord their God had sent him. And the people showed reverence for the Lord. Then Haggai, the messenger of the Lord, spoke by the commission of the Lord to the people saying, “‘I am with you,’ declares the Lord.” So the Lord stirred up the spirit of Zerubbabel the son of Shealtiel, governor of Judah, and the spirit of Joshua the son of Jehozadak, the high priest, and the spirit of all the remnant of the people; and they came and worked on the house of the Lord of hosts, their God, on the twenty-fourth day of the sixth month in the second year of Darius the king. The Israelites had been told to build the temple, but they had given up. As a consequence God had withdrawn from them. The temple of Jerusalem is the “dwelling place” of God. As they give up in building it, he withdraws his presence and with it his blessing. He deprives them. Because they do not build, God keeps their efforts futile. No power of man can bring a harvest that is enough to satisfy. They have enough to live, but not to be satisfied. God does this in order to bring them back to obedience, to come back to him. Yet they also need to realize the state they are in. This is Haggai’s job – to get them to realize the state of deprivation they are in. We sometimes just carry on blindly thinking there is nothing really wrong. We are like the former drug addict who only realizes how bad his life had become when he stops using. We are like the prodigal son who comes to himself one day and realizes his pitiful state as he shovels pig food into his mouth. We never really know that we are asleep until we are awake. God wants to wake a sleepy people, to shake them to their senses – look! Consider your state, how pitiful it is. And why? Because you refuse to obey. You neglect God. You avoid pressing into the hard work of temple building. You neglect the very source of your satisfaction. And so in every other area that you seek to be satisfied you will find an empty plate. For I will deprive you, says the Lord. I will take away even the smallest pleasures. Things that you once loved I will make them tasteless. This is what God does for his people when they give up on him. The Israelites hear the voice of the Lord and, tired and beaten, they pick themselves up. They hear the Lord and they restarted work on the house of the Lord. Yet even this they do only because the Lord stirs their spirits. We are dependent upon God even for our motivation to serve him. He stirs us so that we might want to serve him, to love him. Without his work within us and his work in our experience and his word to command us we wouldn’t want to obey, we wouldn’t have any reason to obey and we wouldn’t know what to do! We are as dependent on God for our motivation as we are dependent on him for the knowledge of the task. Are you awake today, aware of your state? Are you willing for God to stir in you a desire to please him in your life? You know this is what God wants for you. He wants you to want to serve him, to put him first. Second, when the people are discouraged God reminds them of his promise. Are you one who remembers the former times? Times when the presence of God was sweet, when you felt you would burst from the love within you for your Father and for his people. You remember when the churches in America brimmed with worshipers, when you were confident of the Lord’s favor because you could see it? And now you look and you see what remains. You see a small band of very frail people in a building that most ignore on their way to the bar. You, like many Christians, wonder when the government might come knocking to remind you that all that God-talk is no longer welcome in this land. What has become of us? Like the Israelites you are in need of another memory – the promise of God. For God’s promises replace our regrets. When we are discouraged God reminds us of his promise. For the Israelites the promise is for a coming glory in the temple, a “one-day” promise. One day God will come and dwell in such a way that surpasses even the glory of the temple of Solomon. In that past day the queen of Sheba marveled at Jerusalem, but in the future every nation shall be astounded by God’s presence with his people. Those who despise him will be wiped out. Their apparent might will be brought to naught. What appears to be the overwhelming, incomparable strength of nations will be but dust to the one in whose earth they tread. There is none that compares with God. And his promise is this: One day God’s glory will be apparent to every thing that has breath. There will be nothing to compare with that day. Oh, that day! Do you wish for it? This is your promise too. One day Christ will return to make things right. There will be perfect justice. Those things done in the dark will be brought to light. Those under the rod of evil people in our time who cry for justice will be vindicated. The persecuted will be lifted up. The children of God will be made kings and queens. We shall know our savior face to face and dwell for eternity in his presence. For Christ is building his church. He is making it his dwelling place. And he is the cornerstone. One day, though it is hidden from them now, all will see his glory. You are children of promise, a promise given you in Christ, a promise given to the children of Israel – the Messiah. If you are discouraged today know that your work is not in vain. As you obey the Lord look not to that before your eyes but to the coming age when he will come for his people and glory will be all around. What a day that will be! Third, when the people sin God cleanses them. The children of Israel had turned not to great evils but to minor apathy. That’s not so bad you might think, but sin is not the kind of thing that is happy with only small victories. Sin wants it all; it contaminates everything and grows in every corner until it devours everything. The point Haggai makes is that sin is not contaminated and destroyed by the presence of some amount of holiness, but a small amount of sin contaminates all that is holy. If you think a small sin wont harm and that a lot of holiness cleans it up you are wrong. Sin makes even the priest contaminated. Perhaps you, this morning, are aware of no sin in your life. Perhaps you think you are pretty holy. Colin Hansen writes, “the heart is never so deceptively cruel as when convinced of its purity” (Blind Spots). We can sometimes become convinced of our own purity, thinking that we are going through a stage of immunity. Beware! At these times Satan is most powerful. You confidence of your own strength eliminates your ability to rely on God’s strength. And without God’s strength you are ripe for the picking. We must never lose a hatred for sin. As God despises sin so should we. A love of God cannot co-exist with a never-mind attitude to our own evil. Perhaps you are plagued by sin this morning. Perhaps you live with unforgettable regret – what ifs, maybes, if onlys. What is to be done? You, like the children of Israel, are in need of a fresh start. The Lord tells the children of Israel that the past shall not be in their way. From this day forward God will bless them. Do you desire a fresh start, a do over? This, today, is yours in Christ. His love is new every morning. The gospel is the fountain of forgiveness. Come to Jesus this morning and, with all that is in your heart, all that burdens you and contaminates you, and leave with it no more. Start anew, O children of God! And from this day on He shall bless you. Finally, when the people obey, God is with them. This is the point of the temple. The temple is the dwelling place of God. It is where God inhabits his people. The presence of God means something only to those who know what the presence of God is like. The presence of God is only something amazing once you have it. You will never yearn for it until you have experienced it. The children of Israel knew such a presence – God was with them. When God was with them they were at peace, with God and each other. When God was with them they were never alone, God’s presence drove out the feeling of being ignored. When God was with them they knew protection. The Lord of Hosts protected them. They were more secure than anyone with an army. When God was with them they felt his delight, his favor, his approval. You know, God does not give up on his people. Though they wobble they will not fall. Though they fail God will pick them from the ground and he will make them fly. If you hear his voice this morning, he asks you to listen, to awaken, to obey, to surrender to him and allow him to cleanse you of your sin, to put your feet on a solid foundation in Christ, to set your eyes on the promise you have in him, to take your hat off and look to Christ, to the fulfillment of the promise that God has made to his people, to come to Jesus and to his church, to do the work he has called you to – loving your brothers and sisters in Christ, reaching out to those who are lost in the darkness of sin, to stirring up the gifts that God has given you, to forgiving those who have hurt you, to being built up in the church by allowing the word to conform you into the image of the Son.